The Kackleberry Farm cornfield maze, a labyrinth of twists, turns and dead ends, carved into stalks that rise to heights well over your head — it’s an experience that is perfect for those hungry for fun!! We invite you to bring your students to “Get Lost!” in our cornfield classroom! Reservations required! What’s included for a Field Trip? We will take over your class and put your chaperones to work, while teachers relax and enjoy a day on the farm. Sorry, the farm is closed on Mondays. 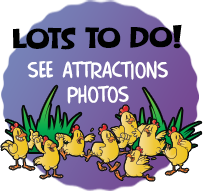 All students, chaperones and extra children are $6 each for Mini-maze Field Trip – $7.50 with cider and donuts or $9 each for Triple-maze Field Trip – $10.50 with cider and donuts. Students (paid) receive: A free pumpkin and a activity book illustrating their experiences on the farm. Teachers are free! Reservations are required! Early reservations are suggested to get the date you would like, as our calendar fills up quickly. Halloween Day is Thursday, Oct. 31. Make your reservations early before we are booked up for that day! School checks are accepted, as well as cash, VISA or MasterCard. Field trips must be paid for on or before your arrival at the farm. Checks should be made out to “Kackleberry Farm”. We are pleased to offer our Classroom in the Corn learning series to make your field trip more exciting and memorable … as well as a better learning experience. Additionally, your class may enjoy this collection of Pumpkin Facts! 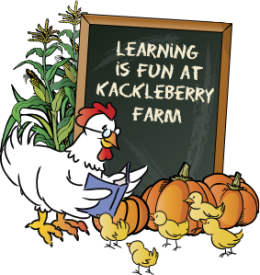 Please check Field Trip Tips for additional information on your visit to Kackleberry Farm.